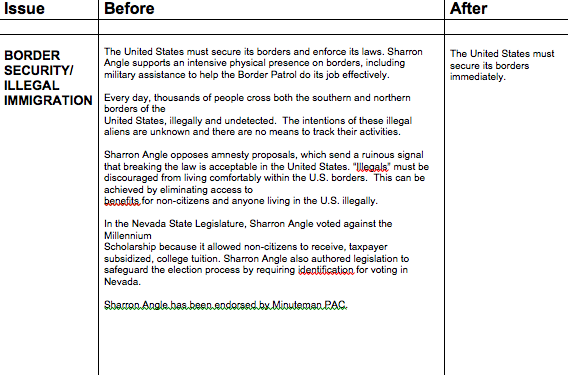 In early June, Senate candidate Sharron Angle spoke emphatically on her website about abolishing the Department of Education, having Social Security "transitioned out" to the private sector, and repealing legislation that prohibited offshore drilling. But today, if you visit the Nevada Republican's website, you'd have no indication that any of these positions were planks of her agenda. After three weeks of rewrites, the Angle campaign has released (with little publicity or fanfare) a new and improved campaign website. It was done with obvious care, and tailor-made to pitch the Tea Party favorite as a mellow-minded conservative alternative to her Democratic opponent, Senate Majority Leader Harry Reid. 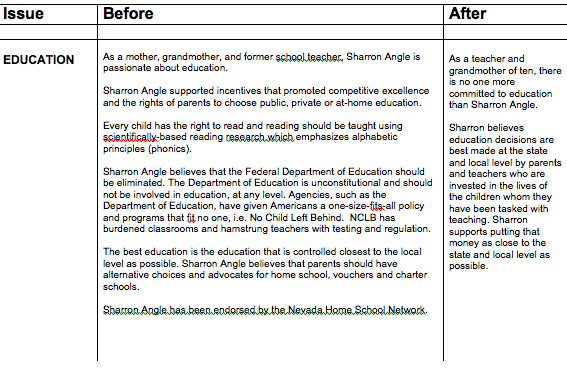 A comparison of the content from both websites shows dramatic, fundamental shifts in her policy platform. For instance, the candidate has gone from calling for the "repeal" of "regulations that prohibit off shore drilling" to a position that is, simply put, the exact opposite. "America's policy should be to enforce the rules and regulations currently on the books with respect to off shore drilling," her new site reads. "The recent oil blowout in the Gulf occurred because BP took a high risk approach in its drilling program while cutting corners, as opposed to the low-risk approach other companies also drilling in the Gulf have taken without incident." Likewise, on the old website, the Senate candidate said she thought "the Federal Department of Education should be eliminated" because it "is unconstitutional and should not be involved in education, at any level." Currently, however, all Angle lists under her Education section is that "decisions are best made at the state and local level by parents and teachers..."
That scrubbing is mild, however, when compared to Angle's makeover of her policy prescriptions for border security and immigration. In her old policy platform, Angle touted the endorsement she received from the controversial anti-immigration group, The Minuteman PAC. That endorsement has disappeared from the new site. Also gone is Angle's stance calling for "an intensive physical presence on borders, including military assistance to help the Border Patrol do its job effectively," and her claim that "The intentions of these illegal aliens are unknown and there are no means to track their activities." Today, the "Border Security/Illegal Immigration" section of her issue page is the slimmest of all. Here is that section, in its entirety: "The United States must secure its borders immediately." Nevada's large Hispanic population is undoubtedly weighing on the author's mind. Asked about the website alterations, the National Republican Senatorial Committee said that it was a normal upgrade for any candidate transitioning into a general election. "Many campaigns revamp and re-launch enhanced websites over the course of an election season," said NRSC spokesman Brian Walsh. "Sharron Angle's positions have not changed though and she remains committed to reversing the economically disastrous policies of Harry Reid while offering Nevada the fiscally responsible leadership they deserve." But even if the revisions offered to Angle's record don't represent position changes (though with respect to offshore drilling, a clear change was made), they do reflect a decidedly tone-downed candidate. No longer does her bio list the endorsement from the "birther" organization, "Declaration Alliance PAC." Gone, likewise, is her call for "free market alternatives" to Social Security as that system is "transitioned out." In its place is a short section that calls for the country to "keep the promise" of Social Security and redeem the IOUs. There are other obvious changes that, under normal circumstances, would seem like drastic attempts to dilute a legislative platform. Angle no longer refers to a cap and trade proposal as "unscientific hysteria over the man-caused global warming hoax" that stepped "over the constitutional boundaries of the federal government and is merely another way to tax the people." As for her reference to the United Nations as an institution "captured by the far left and has become ineffective and costly," that's gone too. Her new website does not, like the old one, call for abolishing the "67,000-pages of IRS code," or for making the "death tax cuts permanent." Nor does it mention her proposal to require that a "supermajority two-thirds requirement" be instituted for passing tax increases. The totality of the changes is enormous and a real reflection of the extent to which Angle was a decidedly non-mainstream candidate who has been thrust into a high profile race. It's also no small illustration of how willing the candidate has been to compromise her Tea Party principles for the purposes of the general election.